The Polikarpov I-16 was known as the Ishak or "Little Donkey." Above is a Type 24 in World War II colors. Located near Moscow, State Aircraft Factory No. 39 was in fact a Soviet prison. Not only was the plane the product of convict labor, even more remarkable, the two inmates who designed it were among the nation's most talented aeronautical engineers. One was Dmitri Grigorovich, creator of the flying boats that had served the Czar's Navy in World War I. The other was Nikolai Polikarpov, who had succeeded Igor Sikorsky in overseeing production of Ilya Muromets bombers at the Russo-Baltic Railcar Factory. Polikarpov had designed several highly successful craft, among them the omnipresent Polivarpov Po-2 biplane. But in 1927, dictator Joseph Stalin had demanded a superior Russian-designed, Russian-built fighter for the Air Force. When two years had passed and neither Grigorovich nor Polikarpov had produced a serviceable fighter, both designers were clapped into prison and ordered to create under the unrelenting eye of the state. Design work on the I-16 Type 1, or Ishak (Little Donkey) as it was named, began during the summer of 1932 at the Central Aero and Hydrodynamic Institute. At this juncture Polikarpov was in the kind of straits that could only happen in the Soviet Union. His career which had entailed a swift ascent to the top post of the OSS (the department for experimental land plane construction), had taken a sudden downward plunge upon the occasion of his arrest during the 1929 purge. Instead of a firing squad or a gulag however, Polikarpov and his design team were sentenced to an "internal prison," there to continue their work under the close supervision and scrutiny of the state. Evidently, his prosecutors judged him too vital to the future of Soviet military prowess to inflict the usual penalties of summary execution or slow death in a labor camp. The first flight of the I-16 was on December 31, 1933, and it was far ahead of any fighter design at the time. It featured retractable landing gear, a cantilever wing, enclosed cockpit and variable pitch propeller. While wire bracing and struts were eliminated by other countries in stages, advanced planes of this type were being developed in Russia as early as 1932. Although not among the best remembered aircraft of the 1930s, it was nevertheless a very able and rugged machine and featured prominently in the events of the time. It was powered by an M-22 (license-built Gnome Rhône Jupiter) radial engine which developed a modest 450 hp (335 kW). It was armed with two new 7.62 mm ShKAS machine guns developed by B. M. Shpitalny and I. A. Komaritsky, which offered twice the fire power of the standard PV-1 and were mounted outboard of the landing gear attach points. It also offered armor protection for the pilot which was considered to be a luxury at the time. The Russian designed Polikarpov I-16 fighter proved very successful in Spain. Despite being underpowered, the I-16 still achieved an incredible 234 mph (376 km/h) and was immediately put into mass production alongside the Polikarpov I-15 biplane fighter. Development eventually led to the I-180, which was powered by a more powerful 1,100 hp (820 kW) twin-row M-88 engine. The I-180 was able to reach a maximum speed of 342 mph (550 km/h). They first entered combat in Spain in November 1936 and if not for the outbreak of the Spanish Civil War, the I-16 might well have faded into obscurity. This war drew support from all over the world. The Nationalists, supported mainly by German and Italian forces, were the better equipped. Britain, France, the United States, the Netherlands, Czechoslovakia and Turkey all sent an assortment of aircraft to the Republican forces, directly or indirectly. But by far the major supporter of the Republicans was the Soviet Union, which supplied 1,409 of the 1,947 aircraft contributed by other countries. 475 of these aircraft were Polikarpov I-16s. In Spain, the I-16s (Type 6) outstanding maneuverability, firepower and rate of climb, surprised the enemy leading to the opposition nickname of Rata (Rat) and the friendly name Mosca (Fly). Now equipped with a 730 hp (545 kW) M-25A engine, (the Soviet equivalent of the Wright Cyclone), it was the most powerful aircraft weapon in front line service with any nation. It had a very high rate of fire and was extremely reliable. Flown in many cases by Soviet pilots, they proved more than a match for German Heinkel He 51 fighters and Arado Ar68, but met their equals in the Italian C.R.32 biplanes and were overpowered by Messerschmitt Bf 109Bs. From March 1937, all remaining I-16s were concentrated into Fighter Group 31, and this was by far the most successful of all Soviet-equipped units. From the lessons learned in Spain, the I-16 Type 10 was developed with two additional 7.62 mm ShKAS machine guns installed in the upper fuselage, synchronized to fire through the propeller. Power was increased with an upgraded 750 hp (560 kW) M-25V engine. Later Type 10 models had an improved reflector gun-sight from the earlier tubular collimator type. The I-16 canopies tended to jam, so pilots generally flew with the canopy open, and Type 10 aircraft were built with open cockpits and fixed windscreens. The I-16 Type 10 reached Spain in 1937 and compared to the Messerschmitt Bf 109B, it had a better rate of turn, better rate of climb and heavier fire power.3 This made the outcome of encounters between the two planes largely dependent on the skill of the pilot. The Type 10 also introduced the first use of RS 82 rockets that were first tested in July 1937. In the Soviet invasion of Finland in 1939-40, captured I-16s were painted with Finnish markings. When the Germans invaded Russia in June 1941, the I-16 was still Russia's most important fighter and despite being obsolete, well over half of the 8,644 built were flown in action until 1943. One of the most startling uses of the I-16 was the Taran or ramming attacks. Equipped with steel-clad propellers, pilots were taught to hit the tail surfaces of German bombers, then bail out. In theory, the strength of the I-16 would allow the pilot grace to bail out afterwards. If German pilots decided to outmaneuver the I-16 in dogfights, which invariably bleed off speed, they were usually caught by surprise as the Russian pilot quickly got the upper hand. However, against slashing climbing and diving attacks, the I-16 was in trouble. Once the Messerschmitt Bf 109E and F models were introduced, it was no contest for the Germans against the I-16. I-16s were purchased by China to fight the Japanese, again surprising the other side with excellent performance. 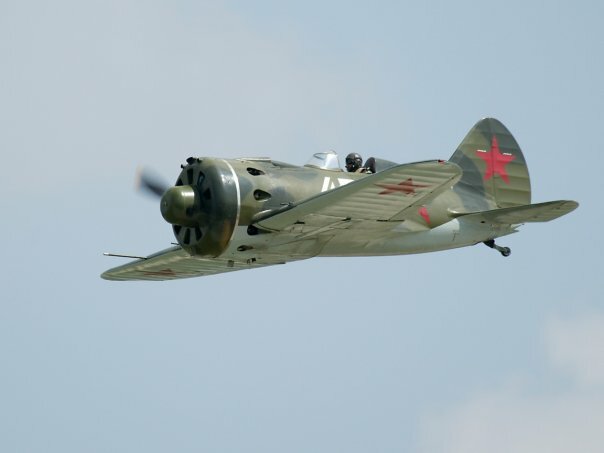 Soviet aircraft had played an important role in both the Japanese and Mongolian conflicts, but the I-16 was eventually outclassed by the fixed-gear Mitsubishi A5M, which was a direct ancestor of the A6M Zero. In 1938, fierce air battles ranked among the largest air battles ever fought at the time. On April 29, 67 Polikarpov fighters fought against 18 G3Ms escorted by 27 A5Ms. Each side claimed victory with the Chinese side claiming 21 Japanese aircraft shot down and the Japanese claiming at least 40 Chinese planes shot down. The Soviets have longed been accused of being copyists by the west. (The same was said of the Japanese before World War II.) In some cases this has been true, but in 1935, when the I-16 made its first public debut in the May Day celebrations, England had yet to order the Glouster Gladiator biplane into production. In Germany, the Heinkel He 51 biplane fighter was just being delivered to the Jagdgeschwader Richthofen. In France, the Dewoitine D.500 fixed-gear aircraft were just entering service with the Armée de l'Air and the Curtiss Model 75, forerunner of the P-36 had still yet to make its first flight. The I-16 was actually undergoing test flights before the first Boeing P-26 was even delivered.5 Far from being a copy of a western design, the I-16 was instead the vanguard of an aviation revolution. While some sources state that the total number of I-16s produced were close to 18,000 to 20,000,6 the current estimate is 8,644. Accurate details on many Soviet aircraft is hard to come by because of the secretive nature of the Soviet Union during the Cold War, records displaced or destroyed during World War II, and because of the limited amount of Russian documents that have been translated into English. The final fling for the I-16 came during the early part of the Second World War, but by then they were overshadowed by more advanced foreign types. Suffering the brunt of the German invasion, those remaining were replaced by more modern fighters in 1942-1943. Shvetsov M-62R 1,000 hp (746 kW) 9-cylinder radial. Two 7.62 mm ShKAS machine guns with two 20 mm cannon. 1. Heiner Emde and Carlo Demand. Conquerors of the Air. New York: The Viking Press, Inc., 1968. 2. William Green. Famous Fighters of the Second World War. Gardern City, New York: Doubleday & Company, Inc., 1975 . 155-156. 3. Kenneth Munson. Fighters 1939-45, Attack and Training Aircraft. New York: Macmillan Publishing Company, 1975. 110. 4. Withold Liss. Aircraft in Profile; Voulume 6, The Polikarpov I-16. Gardern City, New York: Doubleday & Company, Inc., 1970. 6. Created January 20, 1998. Updated December 15, 2013.